The attorney meeting has been rescheduled for November 12, 2018. We do not have a time yet. It will be posted as soon as we get that information. Thank you. Stay tuned to our admin news coming. 10/02/17 NOTICE: In accordance with Article 5.2 of the CC&R’s of the Riverview Resort, a Special Board Meeting has been called by at least two Board Directors to discuss an issue facing our Resort. The meeting will be held in the Grand Room on Thursday, October 5, 2017 at 1:00 p.m.
8/30/17 NOTICE: The pool area will be closed on Tuesday September 5, 2017 to start the turf landscape project. They will begin around 7:00 am, It will remain closed even during the evening hours due to debris being in the pool from the grass removal. It may possibly be closed all day Wednesday and Thursday. For safety reasons, please do not enter the pool area during this project. 8/29/17 NOTICE: The office will be closed for Labor Day on Monday September 4, 2017. 8/29/17 NOTICE: The water will be shut off on Tuesday September 5, 2017 from approximately 7:00 am until 11:00 am for testing required by Epcor. 8/09/17 The Tuesday night potlucks have been cancelled until September. Mexican Poker will continue. 8/09/17 Someone has been removing the ad notices from the bulletin board near the Grand Room door. If you did not place the ad on the board, please do not remove it. Riverview has a bulletin board right outside the Grand Room that residents can post their items for sale, or their rentals, etc. This is a free service for residents of Riverview. Someone has been removing these notices for quite some time now. We now have you on video. We don’t know who you are yet, but will hopefully find out. Please do NOT remove the notices if they are not yours. This board is monitored by the office and when the notices expire, we remove them. 7/18/17 The work on the golf course bridges and cart paths will begin on July 24, 2017. It will take approximately 3 weeks to complete. 7/18/17 The meeting with the Attorney that was scheduled for July 27th has been cancelled. The attorney had a trial come up in Flagstaff. The meeting was regarding recent changes in HOA law that will take effect in August. We will be receiving information from the attorney regarding these laws, and will pass on the information as soon as we can. 5/18/17 There has been a change in the Suddenlink billing. Because Suddenlink closes their billing on the 25th of the month, we now require any disconnects of your modem to happen by the 23rd of the month in order to not be billed for the following month. This also means that your modem can be turned on earlier and avoid paying an entire month of service. 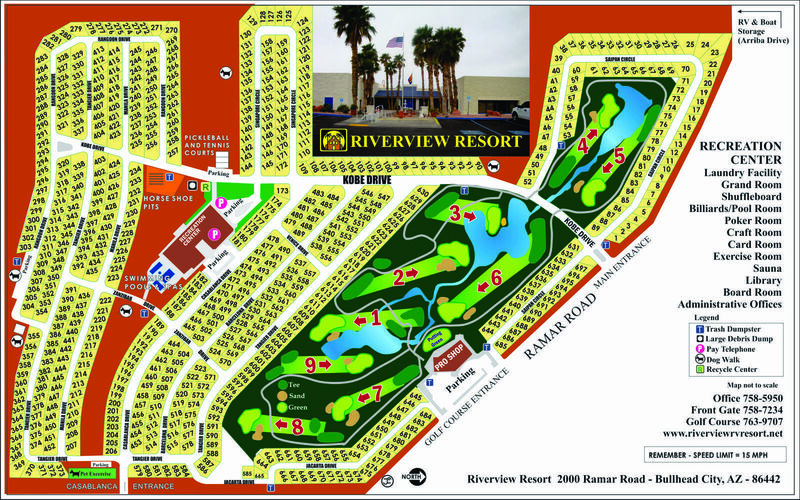 The due date for you to pay Riverview will remain the 1st of the month. I know this sounds confusing, so if you have any questions, just contact the office. 5/08/17 The summer office hours begin today. The office is open from 7:00 am until 3:30 pm. Closed 12:00 – 12:30 for lunch. Please be sure to fill out an exit form if you are leaving for the summer. This is in case we have to contact you while you’re away. A copy of the updated rules that were approved on March 21, 2017 that include Lot Maintenance, Pet Rules and Facility Use, were placed in your in-house boxes. If you have any questions, please see the office.